Soyuz-2.1a carrier vehicle with Lomonosov, Aist-2D and SamSat-218 satellites inside is placed on the Vostochny space center's launch pad. 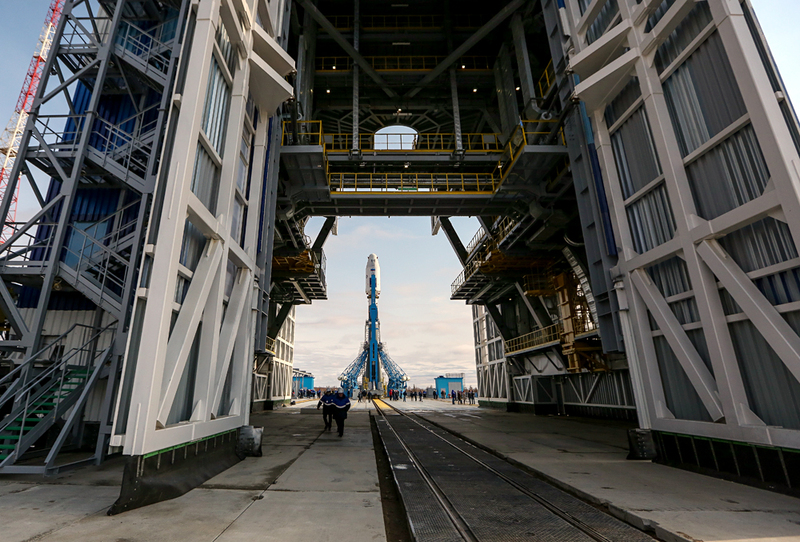 Russia inaugurates the new Vostochny Cosmodrome on April 28. TASS has the exclusive on how the spaceport and its city were built. The decision to build the new launch site was made in 2007 when it became clear that the old Soviet-era infrastructure in Kazakhstan required substantial investment. Russia decided it was pointless to invest heavily on another country's soil, not to mention that it also paid for the use of Baikonur; annual rent and operation costs amount to approximately $225 million USD. Vostochny's price tag, however, is steep, and Russia is spending an estimated $6-10 billion dollars on the entire complex and relevant infrastructure. The project's high cost is due to the need to build all the necessary infrastructure from scratch. The undertaking is reminiscent of mammoth Soviet-era construction projects in Siberia. There were missed deadlines, workers' strikes, and criminal investigations, not to mention President Putin's harsh remarks directed toward the builders. A TASS correspondent went to the Amur region to get the scoop on how the new space port has changed the lives of ordinary Earthlings in Russia's Far East. The Vostochny Cosmodrome is located near two small cities that are closed to outsiders; only those with a local residency permit, or special entry permission, can visit. Uglegorsk has existed since time immemorial, while the city of Tsiolkovsky is still under construction. Technically, both cities merged two years ago and today there is only Tsiolkovsky, but the road that will connect them is yet to be completed. Still not used to the new name, locals continue to refer to the older Soviet-era city as Uglegorsk. The first space center near Uglegorsk was built in 1996. Named Svobodny for the district in which it is located, this space center began to take away some launches from Baikonur. The site was not chosen randomly. Since 1969, the Svobodny district was home to a strategic military missile division. In order not to attract attention to the construction of launch facilities for ballistic missiles, the closest town was named Uglegorsk; ("ugol" is the Russian for coal). Coal, however, was never produced there, and the town received the status of a closed city. In 1994, the missile division was disbanded, but the military began to work at the Svobodny Cosmodrome, which was put into operation two years later. Over the next 10 years it launched five rockets - one Russian and four foreign (American, Swedish, and two Israeli). In 2007, Svobodny ceased to operate and construction began on the Vostochny Cosmodrome, which would be twice as large as the old site. Uglegorsk remained a closed city, and its population is now 6,000 people, nearly all of whom work in the space program or related services. Time seems to have stopped here. The stadium is overgrown with grass, there is a Soviet-era bas-relief on the wall of a children's center, and a small park with a monument to the first man in space, Yury Gagarin. According to Dmitry Tetenkin, deputy chairman of the Amur region's government, the regional authorities requested the inclusion of Uglegorsk in the Russian Space Agency's federal program to develop space centers from 2016 to 2025. Plans call for gas mains to be installed, 33 apartment buildings to be renovated, 20 kilometers of roads to be repaired, and athletic facilities to be built. In addition, the city will receive a cultural complex with a modern library and a children's center. Schools and kindergartens will be needed. Top specialists will receive apartments in Tsiolkovsky, which will house 20,000 residents. So far, it looks merely like a new neighborhood and not a city. Still, specialists are pouring in from Baikonur, and also from major Russian cities. Today, Tsiolkovsky has four multi-story houses and a shop, and is connected with the launch site by bus. You can walk the entire city in a few minutes, or take a stroll to the stadium. Sports get special attention here. Three football grounds and cycling paths will soon appear close to the new houses, and a children's garden with swimming pool will open in the autumn.